As if faking the video wasn’t bad enough. This is a still from Nokia’s new product promo video. 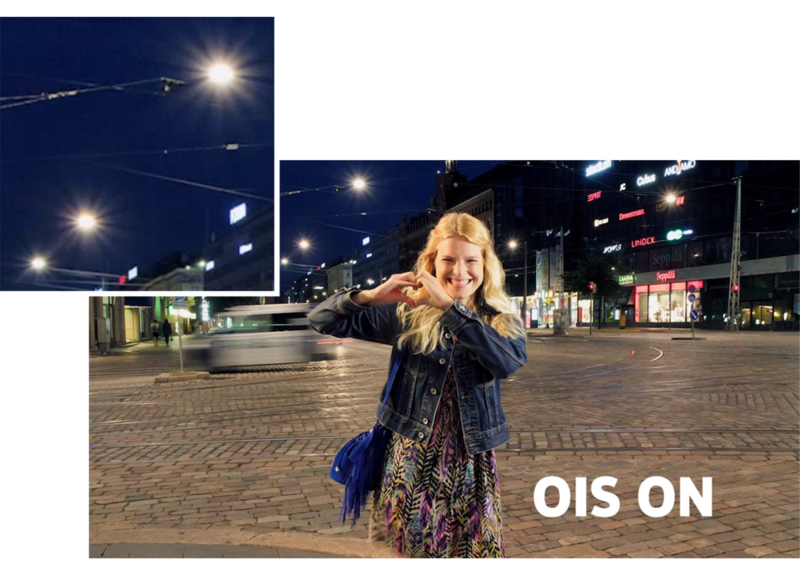 It’s showing off their apparent Optical Image Stabilization (OIS) on their new device, the Lumia 920. 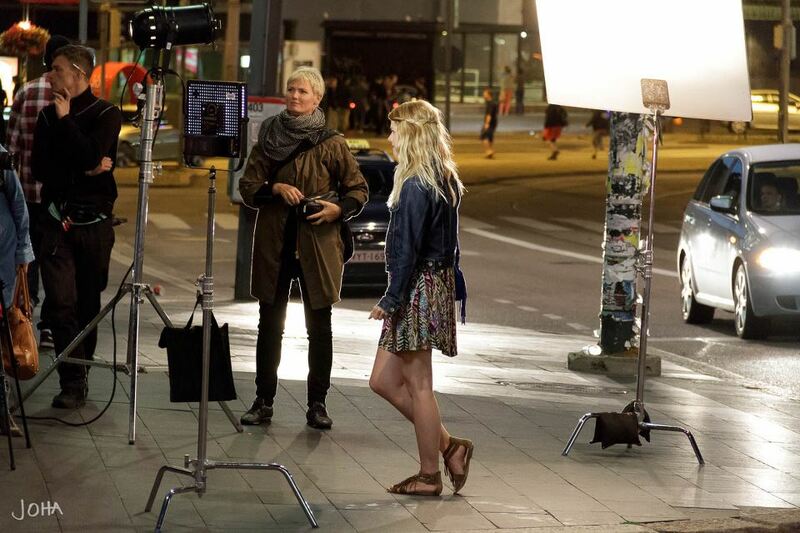 Being a Finnish company, Nokia shot these scenes in Helsinki of course. I’ve lived in Helsinki, and where these photos were taken, there’s no lighting like this. Pretty much all street-lighting in Helsinki originates high from the center of roads. It’s ambiently diffused, not spot, as this video would have you believe. When you live through 20 hours of daily darkness in the winter, you start to notice these sorts of things. I decided to do a bit more research based on the data we have at hand. Going by these still images it’s hard to tell what device really took the photos. We don’t have the EXIF data because these are part of a video, and there’s no cheeky reflections we can zoom in and enhance. However, there is one thing, that once seen can’t be unseen. Diffractions. 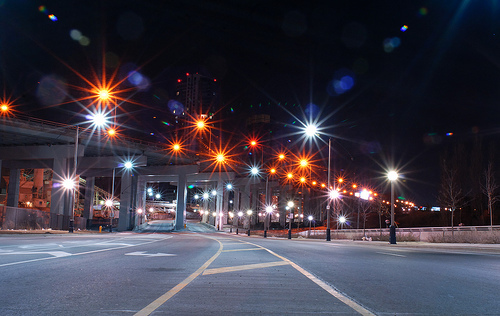 Diffractions are the sparkle affect generated around the bright lights in the background. Diffraction occurs when light hits an opaque edge in the light path, such as the aperture blades in the lens. Diffraction causes the light to be spread out in a plane that is perpendicular to the edge from where the diffraction occurs. So you get two points of sparkle from one edge. It’s impossible for a camera with a fixed aperture of f/2 to generate so many spikes from a light source. These kind of diffractions are typical of a DLSR camera with a smaller aperture like f/22. So, it makes perfect sense that if Nokia were to fake the video, they would also fake the stills; which they almost certainly have. UPDATE 1: And if there are any doubts left in your mind. Above is a photo (ApolloPureView-image2.jpeg) grabbed straight from the Nokia Lumia 920 launch site, also taken in Helsinki under very similar light conditions. Check the sparkle of the lamp to the right of the girl. That’s pretty much exactly how an f/2 diffraction should look like. 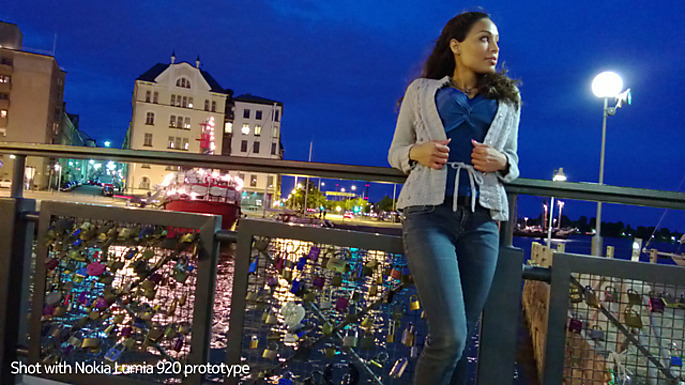 UPDATE 2: and finally.. A Hacker News user by the alias exDM69 astutely shared a photograph of the photoshoot in Helsinki city center. The photo was taken by a friend of his. I knew an image of the photoshoot would surface sooner or later, how could it not. You can just about see the DSLR lens on the very left center of the photo. I’m left with no other choice but to ask, is life even real? You probably shouldn’t follow me on twitter. By the way, this isn’t the first time Nokia have lied about the quality of their products. Let us not forget the Nokia N97.